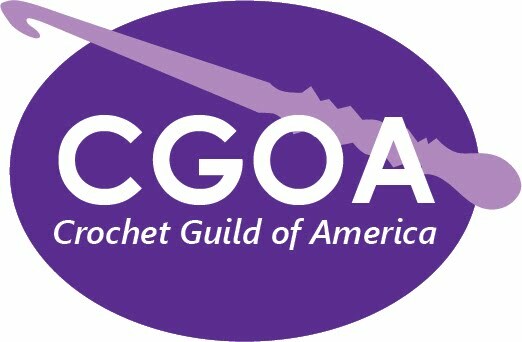 Reason to Join a Local CGOA Chapter #6: Local Crochet Experts! 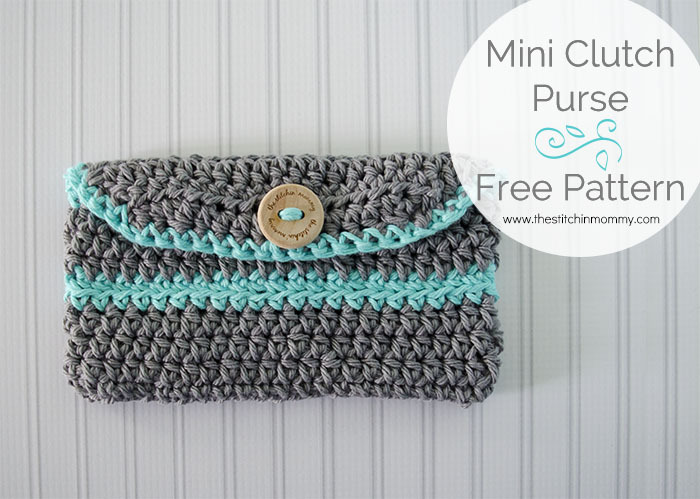 One of the best things about learning how to crochet in the digital age is having a library of free resources at your fingertips! When you want to learn a new technique, all you need do is type the name of the technique in Google, and suddenly all the video and photo tutorials you could ever want are right in front of you. But sometimes the photos are not clear, or the video is at a funny angle, and sometimes it would be really nice if the person who made the tutorial was just sitting right next to you telling you exactly what to do. Obviously that's just not going to happen in most cases, but on the bright side, your local guild chapter is a place you could go to meet crochet experts in your area who could potentially help you with whatever has left you baffled. And sometimes, the particular expertise that your local guild members have may surprise you. At our last meeting, I had the pleasure of meeting Karen C. K. Ballard of Threadwinder. If you have ever read CGOA's newsletter Chain Link, you may have happened upon a regular column that focus on the history of crochet. This has been one of my favorite features of Chain Link, and as it turns out, it is written by none other than Karen Ballard! I'm Marie Segares from Underground Crafter and this is the eighth post in my monthly series highlighting a CGOA member with an interview. 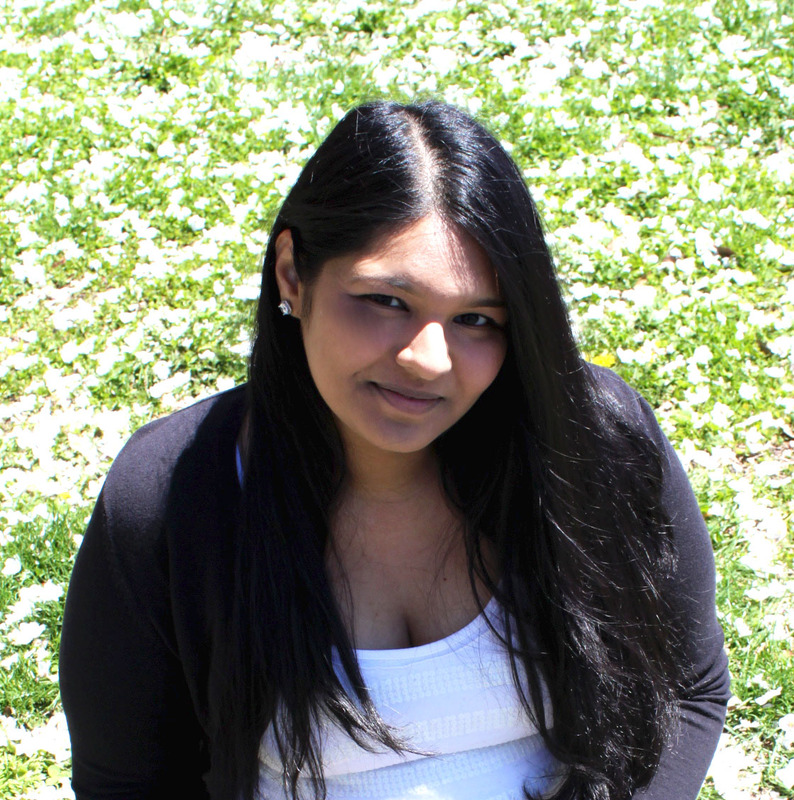 This month's interview is with Amy Ramnarine from The Stitchin' Mommy. Amy is a freelance crochet designer and blogger. Amy has been crocheting for seven years and she is also a knitter (on and off). Amy has been a professional crochet designer for the past four years and also shares recipes and craft projects on her blog. Prior to her design career, she worked as an Analyst at Goldman Sachs for five years and was a preschool teacher for two years. She's now a work-at-home-mom of two living in New York. You can find Amy at The Stitchin' Mommy, or follow her on Etsy, Facebook, G+, Instagram, Pinterest, Ravelry, and Twitter. All images are used with permission and are © Amy Ramnarine/The Stitchin' Mommy. 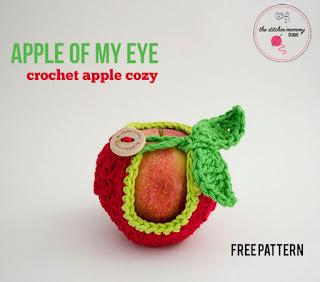 Apple of My Eye Apple Cozy, free crochet pattern by The Stitchin' Mommy. Amy: A friend of mine tried to teach me how to crochet about 8 years ago. I didn't really catch on but I was determined to learn since I was between jobs and needed a hobby. I started watching YouTube videos and borrowed crochet books from the library. I started teaching myself how to crochet and it eventually brought me to where I am now. Kiss Me at Midnight Quick Cowl, free crochet pattern by The Stitchin' Mommy. Amy: I started designing about 4 years ago. I had been crocheting for a few years already and I was ready to express myself through crochet with my own designs. 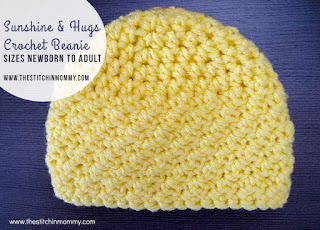 Sunshine and Hugs Beanie, free crochet pattern by The Stitchin' Mommy. Amy: I have been a member of the CGOA for two years now. 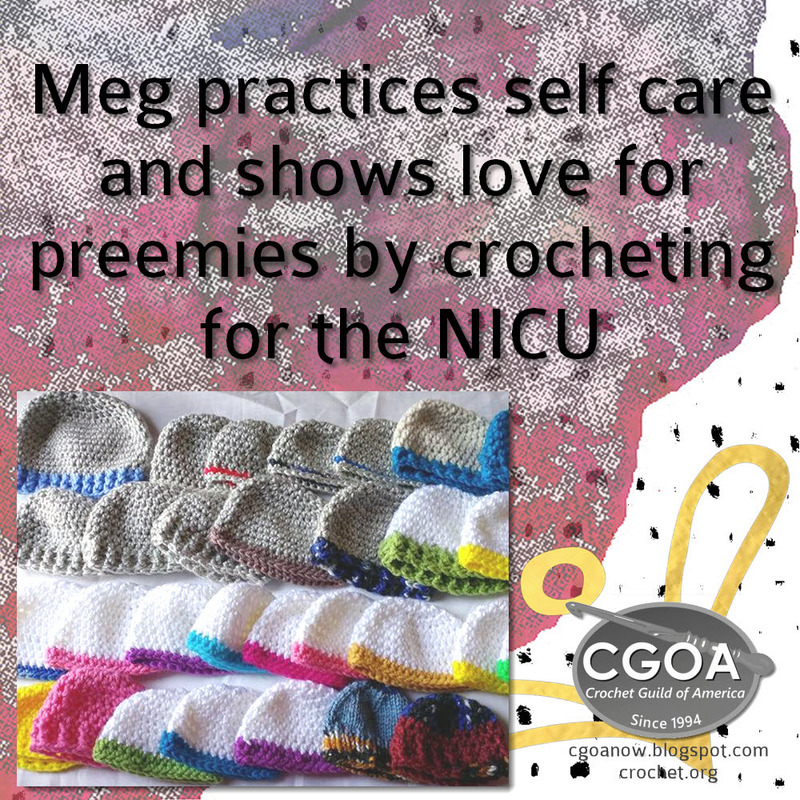 I love that the CGOA allows crocheters to connect with one another through the CGOA website and in person through local chapter meetings and the CGOA conference. I also love that the CGOA provides all of it's members with opportunities to learn and grow with the help of reading materials, classes, and other programs. 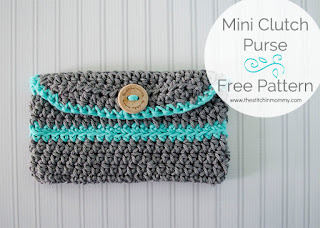 Mini Clutch Purse, free crochet pattern by The Stitchin' Mommy. UC: You used to be a preschool teacher. Has your background in teaching had an impact on your designing and blogging? Amy: I think the organization skills that I picked up when I was teaching have helped to keep me organized during my blogging career. I have definitely utilized my task management and scheduling skills when it comes to working with sponsors, yarn companies, and other bloggers. Now if I could only utilize the skills to help me clean up my craft room! Stashbuster Granny Stripe Afghan, free crochet pattern by The Stitchin' Mommy. Amy: I like to work on blankets that have a very easy stitch pattern so that I don't even have to look down. I can just continually crochet without thinking. 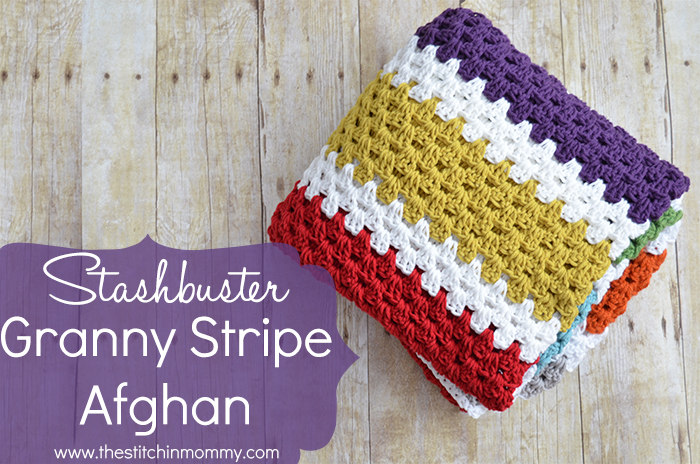 My favorite easy one to work on is my Stashbuster Granny Stripe Afghan. Rising Sun Afghan Square, free crochet pattern by The Stitchin' Mommy. Amy: Anything related to Tunisian crochet. I am still a novice with Tunisian but I do enjoy a good challenge. 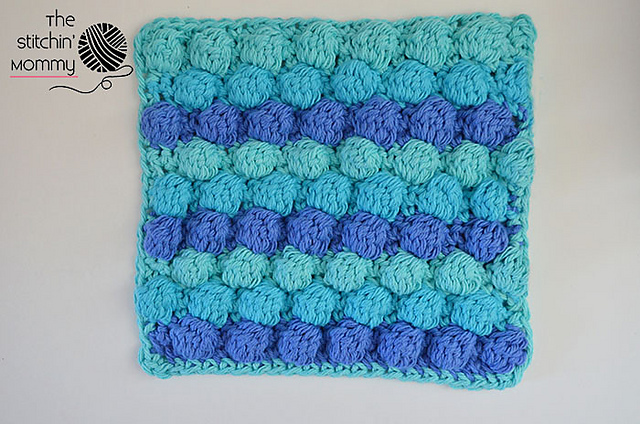 Little Bubbles Dishcloth, free crochet pattern by The Stitchin' Mommy. 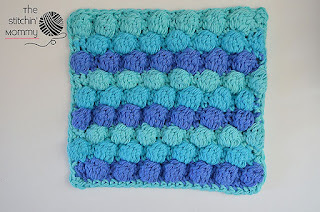 UC: What are your favorite types of crochet projects for warm weather? Amy: I don't really like to sweat it out in the summer under a huge wool blanket so, tote bags and anything that I can use around the house like baskets, coasters, and dishcloths. Shell Stitch Baby Blanket, free crochet pattern by The Stitchin' Mommy. Amy: Baby blankets. They are near and dear to my heart. I make a baby blanket for all of my friends and family members when they are expecting. It's been a kind of tradition of mine that I plan to keep going for as long as I can. This was the first one that I designed. 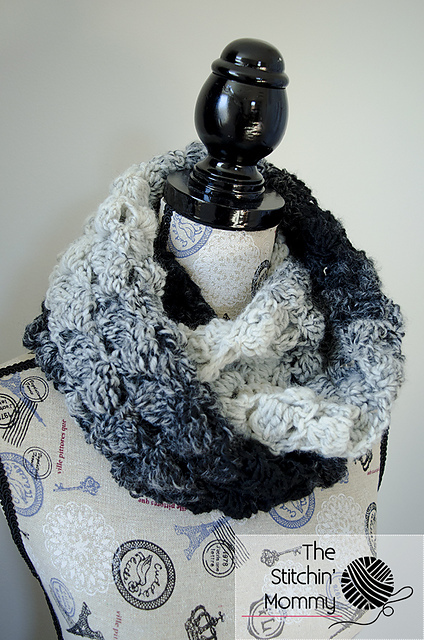 Fluffy Clusters Infinity Scarf, free crochet pattern by The Stitchin' Mommy. Amy: I am going to continue to help myself grow by learning new techniques and skills. I am also hoping to continue growing my blog. I want to design more garments. I have been afraid to tackle them for a while but am starting to feel a little more confident. I have a few other amazing projects coming up that aren't finalized yet but I will share them on my social media sites when things are official :). Thanks for sharing your love of crochet with us, Amy! I've always been a big fan of hexagon motifs. There's just something about the roundness and symmetry of the shape that appeals to me, more so than squares and other shapes. Maybe it's just because I associate them with snowflakes - all hexagons, but all so different. With 75 colorful and unique designs, this book definitely doesn't disappoint! You're bound to find the perfect design for any project. In fact, you'll probably have trouble deciding between them. 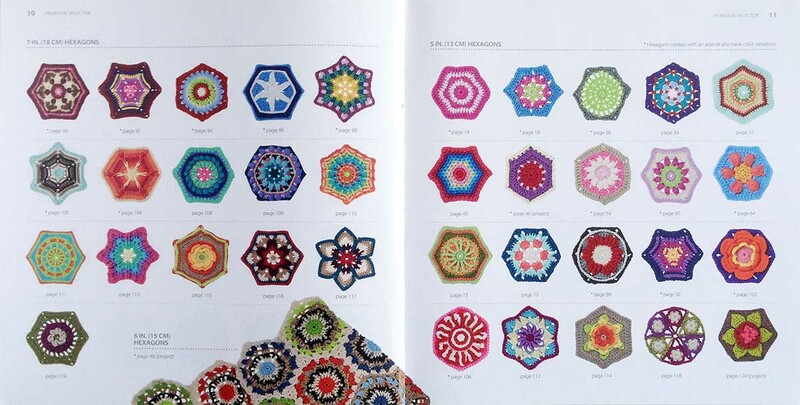 To help you choose, the book starts out with a 4 page hexagon selector gallery, showing all the different designs. It then goes right into the motif designs, including both written and charted instructions. The designs are divided into 3 sections according to difficulty level: beginner, intermediate, and experienced. At the end of each section, there are project patterns that are made using the hexagon motifs. 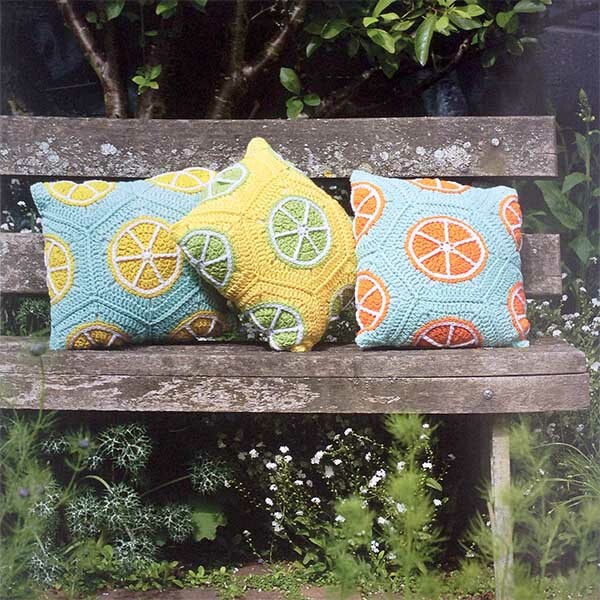 My favorite are these sunny and bright Citrus Pillows. The last section of the book contains information on tools and techniques. 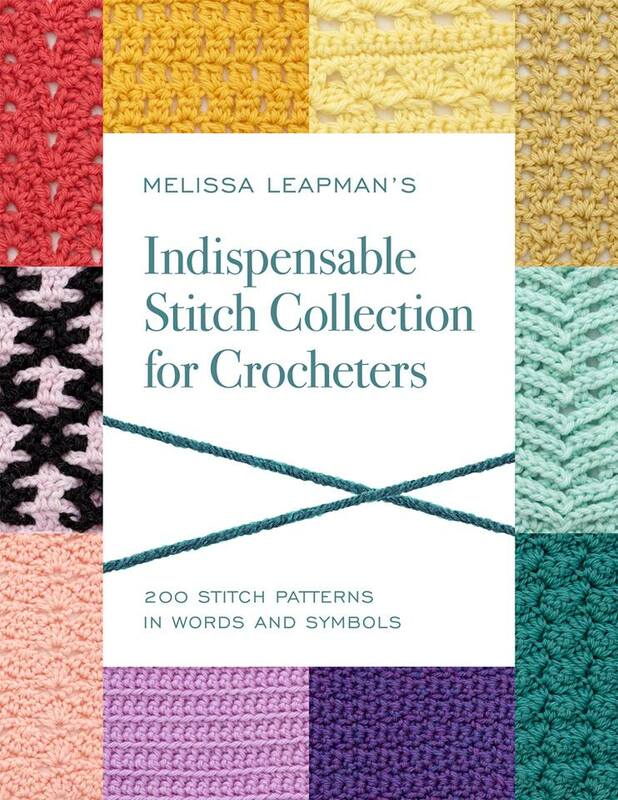 This includes illustrated instructions for basic stitches and a few more advanced stitch variations. 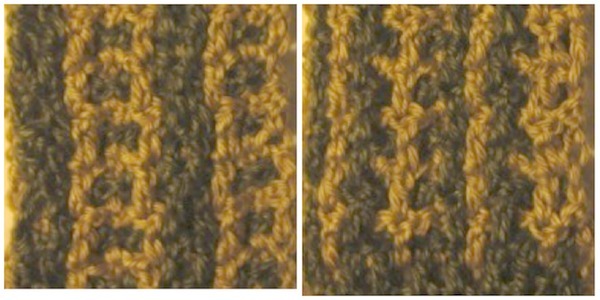 There are also tips on gauge, blocking, joining motifs, and much more. The publisher, St Martin's Griffin, has generously agreed to give away a free copy of this book! To be eligible, you must be 18 years of age or older, with a valid, US or Canadian shipping address. The winner will be contacted by email, and must reply to that email and provide the shipping address within 1 week in order to receive the prize. If the winner does not reply within 1 week, a new winner will be selected. The giveaway ends on August 31st. Hurry and enter below! 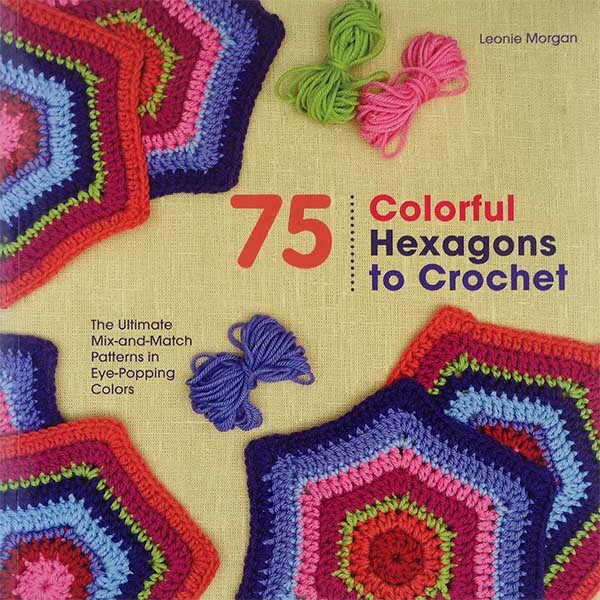 Disclaimer: A free review copy of 75 Colorful Hexagons to Crochet was provided by St Martin's Griffin. Although I accept free products for review, I do not accept additional compensation, nor do I guarantee a positive review. My reviews are based entirely on my honest opinions. All images of copyrighted material are used with permission. 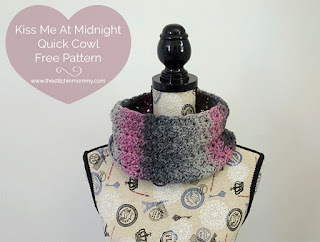 Layers of Texture Infinity Scarf CAL Part 6: Dots and Dashes Stitch; Assembly and Finishing; Giveaway! 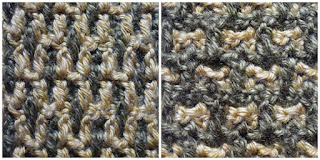 You can get the stitch pattern for Part 6: Dots and Dashes Stitch; Assembly and Finishing on Underground Crafter here. Part 6: Dots and Dashes Stitch. Enter the giveaway below by 11:59 p.m. Eastern on Sunday, August 28, 2016 by sharing a completed project picture for your chance to win a great prize! Layers of Texture Infinity Scarf Crochet-a-Long Part 5: Morse Code Stitch and Giveaway Sponsor Update! I don't know about you, but one of my favorite parts of a crochet-a-long is the prizes at the end. 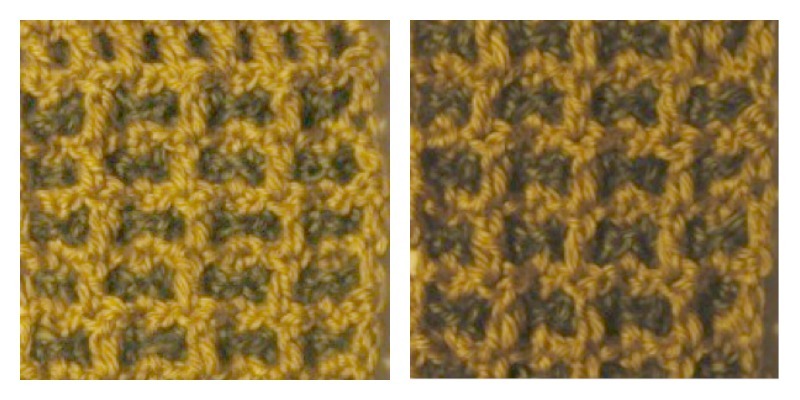 Learning new stitches is fun and who doesn't love chatting with other crocheters? But, c'mon, you know you want to hear more about the giveaway prizes, so let me go right ahead and share the details with you. 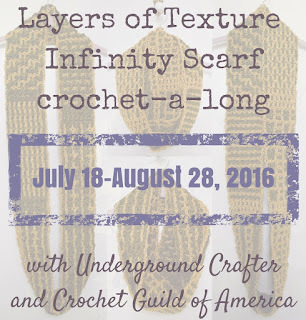 Crochet Guild of America is providing one fantastic prize. Show your support by following CGOA on Facebook and Twitter! CGOA is offering a one-year individual membership to one lucky winner! 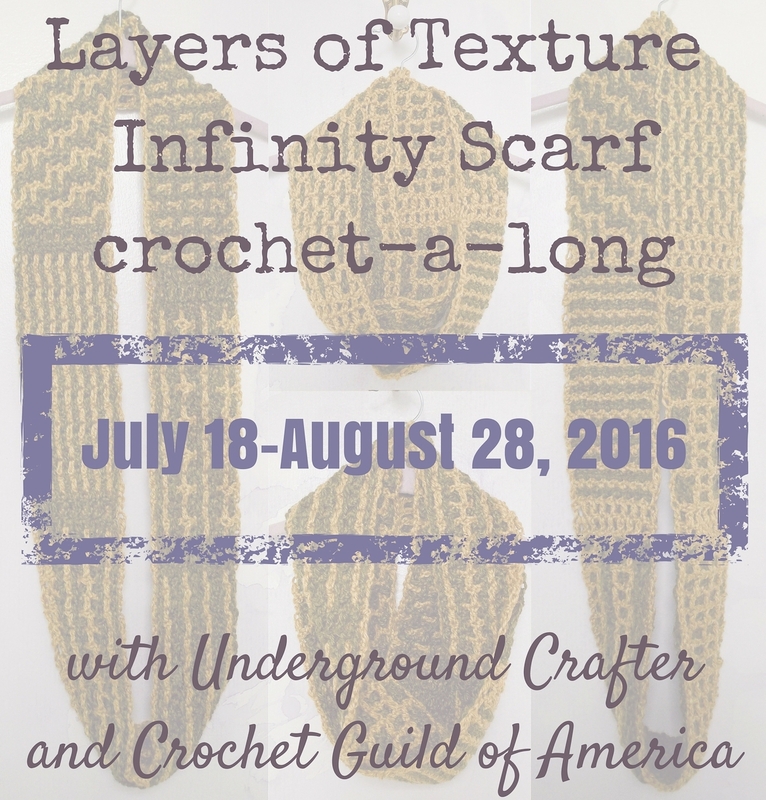 This CAL has introduced many crocheters to the Guild, and now you'll have the chance to get to know it even better. GMC Books is providing two fabulous prizes. Show your support by following GMC Books on Twitter! Animal Heads: Trophy Heads to Crochet by Vanessa Mooncie (reviewed here on CGOA Now! by Pia from Stitches'N'Scraps) is a book featuring 10 delightful crochet patterns with helpful tutorials. Granny Squares and Shapes: 20 Crochet Projects for You and Your Home by Sue Pinner (reviewed here on CGOA Now! 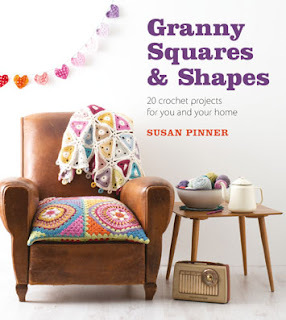 by Pia from Stitches'N'Scraps) is a book featuring 20 designs, including home decor and wearables, along with tutorials for motif projects. Mad Mad me is providing one handmade prize. Show your support by following Mad Mad me on Facebook, Instagram, and Twitter. Charissa Ragsdale is the crochet designer maker behind the Etsy shop, Mad Mad me. You can see some more of her current work in the shop! Quarto Group is providing one amazing prize. Show your support by following Quarto on Facebook, Pinterest, and Twitter! 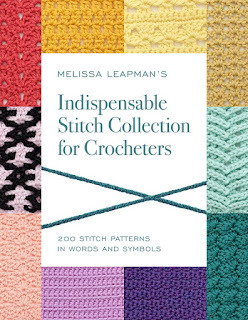 Indispensable Stitch Collection for Crocheters: 200 Stitch Patterns in Words and Symbols is a brand new stitch guide from bestselling author, designer, and teacher, Melissa Leapman. More details about how to enter the giveaway will be shared along with Part 6. 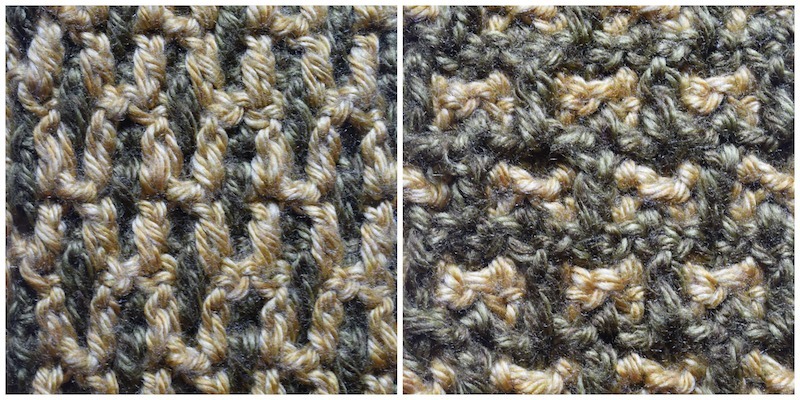 You can get the stitch pattern for Part 5: Morse Code Stitch, here on Underground Crafter. 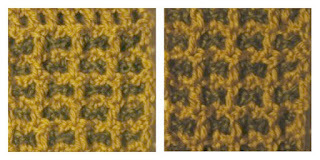 You can get the stitch pattern for Part 4: Grids and Columns Stitch here on Underground Crafter. 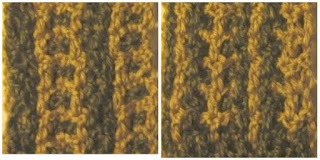 You can get the stitch pattern for Part 3: Chains and Spines Stitch here on Underground Crafter. Or, watch the video below. July was hot and tumultuous, but also fun and full of love! August is the month that transitions us from summer's change of pace into the new school year. But what does that mean for a crocheter? For parents, it could mean more available crochet time. Grandparents, aunts, and uncles may want to spoil their school-age relatives with handmade accessories, blankets, or school supplies. Teens and college students, may start to work quick projects to balance stress levels and/or improve focus during lectures. For commuters like me, the increased traffic will lengthen commute time, necessitating the tightening of morning and evening routines. 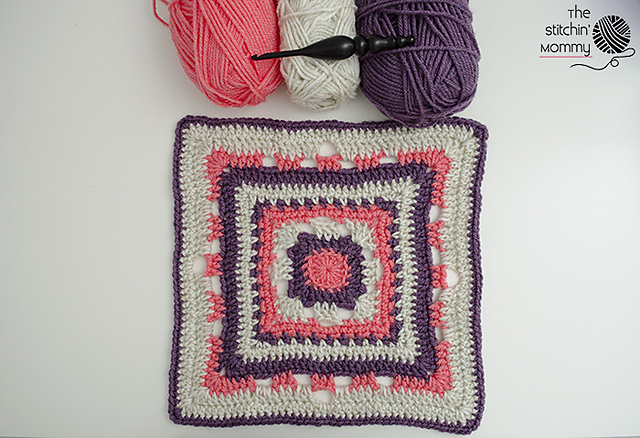 As these transitions fall into place, how are you going to work crochet into your new routine? 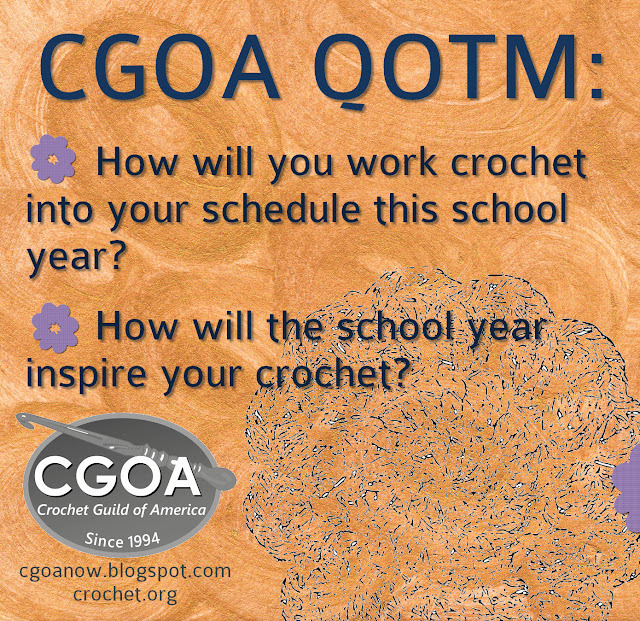 If there is no schedule change, how does the new school year inspire your crochet? As for me, I am going to take a crochet kit with me on my commute so I can sneak in a few stitches here and there (while parked only!) I have found that sometimes just adding 2-3 minutes extra in the car can really add up in terms of completing a project. My car project will be simple and intuitive. Nothing fancy! I have a few crochet time-finding ideas. Parents - Put down your cell phones during pick up and drop off and pick up the hook instead! Extended Family - Find out your school-aged relative's favorite character and crochet a hat with those specifications. 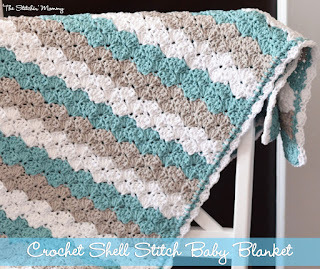 For college students, crochet a thick and comfy blanket in the school colors. High School Students - For those times on the bus or waiting for class to start, have a simple project nearby. 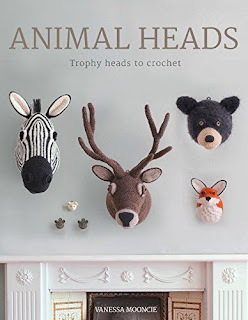 Maybe you could make amigurumi and sell them to your classmates for some extra cash! But how do YOU schedule crochet in the new school year? And how does the school year inspire your crochet (if at all)? Last month was all about showing love through crochet and we got a lot of love on the Facebook post and the blog. I show my friends and family love by making them surprise blankets. I show myself love by using crochet as therapy: it is calming, it creates flow, it makes me feel good about myself knowing that I am going to make someone else happy. Facebooker Susan crochets blankets for Linus Connection, and prayer shawls. She also designs gifts for her family members. Pam is a fellow prayer shawl crocheter. I am sure they provide much comfort to those in need. Bobbie shows love by teaching her friends to crochet. Linda is going to make scarves for the troops. Tammy makes scarves and clothes for winter clothing drives. Sherry shows love by how much she enjoys crochet. Thank you to all who answered last month's question. It means everything to learn more about fellow CGOA people. And I loved seeing a picture of Meg's work. I want to know all about your fall crochet schedule, so let's keep the conversation going. Please leave a comment here on the blog, or on the CGOA facebook page! Do you want to connect on social media? I can be found on facebook, Instagram, and SnapChat (It's fun!). 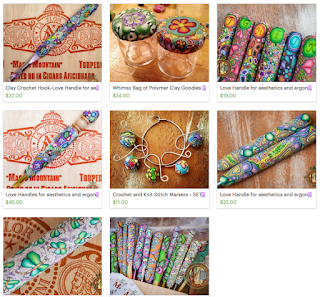 Join my newsletter about crafts, crochet, and education.